An excellent practise for numbers! This mandatory question is accompanied by many other thoroughly boring & mundane ones like what did you have for breakfast? What did you do in school yesterday? What did you draw this week? While I personally would die of boredom having regular conversations with a 4 year old on facetime, my parents' level of consistency & enthusiasm cannot be faked! Quality time spent with the Grands every Saturday morning is precious (for us too- we get to roll in the beds for a bit longer!) 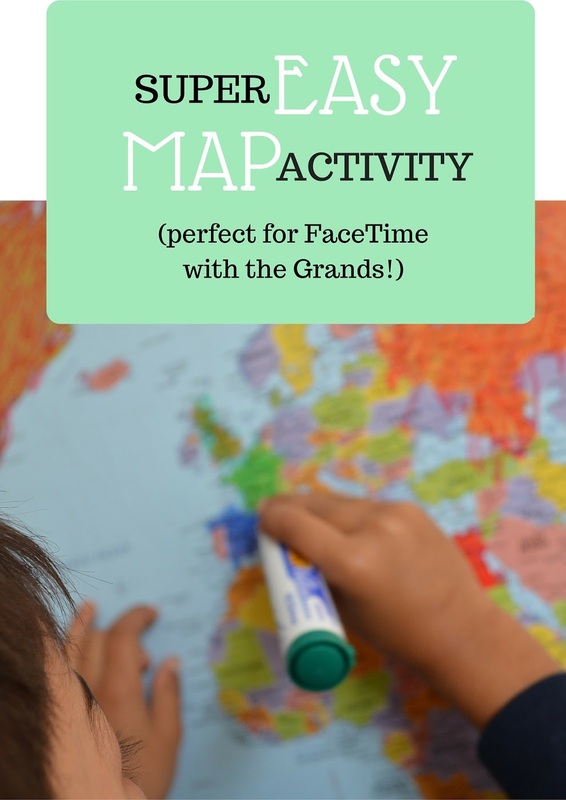 so here’s an activity I’d recently introduced that can actually be played via FaceTime! Play it! Keep your device facing the map. 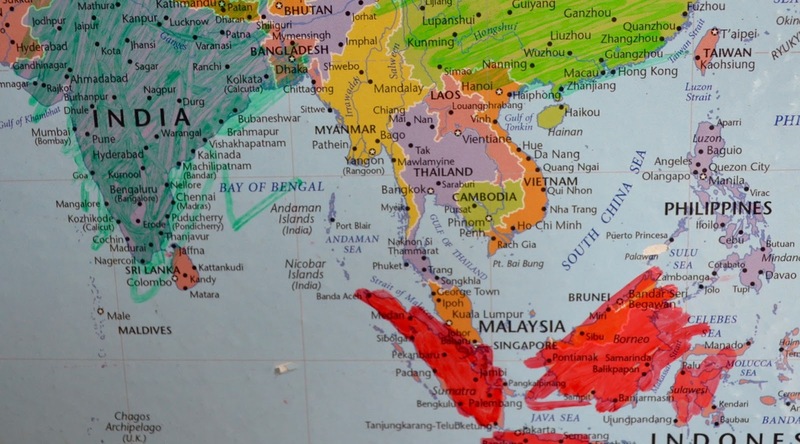 Say a name of a country aloud and your kid goes colors it on the map! Benefits: Not just the world around us, but sounding out words too. Caveat: Be careful of certain dark colors such as RED, that are a bit difficult to wipe off completely! Since our map’s still blushing red, this color is off limits! Tip: For big countries such as Russia, we’ve switched to only stripes & dots - saves the grand effort of erasing! My son is pretty keen about aspects of geography, here’s my post on how we began with a map & globe to how we used bird/animal/monument crafts to take it further. 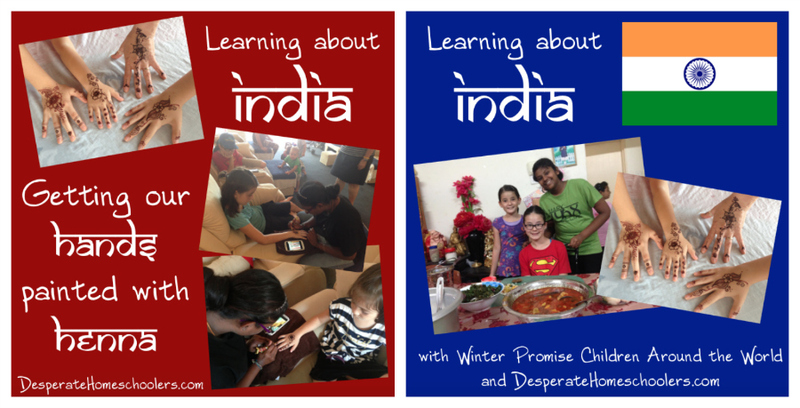 While w.r.t cultural aspects of different worlds we’ve only touched upon languages, here’s an interesting post on Learning about India, by Tina Chen, an American Expat living & homeschooling her five children in Malaysia. She starts with Food, which is an excellent idea because what is more cultural important than cuisine?! (Plus every time I meet someone new, they simply rave about it!). She lists out several hands on activities (such as henna & rangoli) and has an interesting collections of books too. I still love using maps with our boys! So much fun to do with the Olympics coming up this year! It's good to instill the travel bug early! This is a great idea. We're always looking for new things to do via Skype. We're just starting to use a world map for my curious 3yo to learn where our family lives (Europe, Middle East and Africa). I love your map post too! What a fabulous idea. I always loved playing map games as a kid, and have been looking for more ways to incorporate them at home for our kids (beyond the traditional puzzles). Perfect! Great idea. I should play myself. My geography is pretty terrible. I also like the early morning facetime idea. Shame our grandparents are behind us, it's the middle of the night there when it's morning here.